1 (GE/NL) Corps, ready for operations! The security context in Europe is changing. As anticipated following the end of the Cold War, a variety of security challenges present themselves to European countries individually and collectively. This environment has motivated NATO leadership to develop a force structure capable of responding to a variety of situations, across the range of military operations. Moreover, to direct these forces in operations, the Alliance has devised a flexible headquarters structure, including Joint Task Force Headquarters (JTF HQ) focused on small, land-focused joint operations (JTF HQ (L)). Commander 1 (German/Netherlands) Corps, Lieutenant General Michiel van der Laan, has taken on the challenge of transforming the headquarters into a JTF HQ (L). The headquarters is now prepared to fulfil this role and ready to act based on its foundation of being ‘rapid – comprehensive – decisive’ with its comparative advantage centered in the middle. It was thought that the post-Cold War environment would be described by the acronym VUCA – volatile, uncertain, complex, and ambiguous. While much of the past 15 years have been dedicated to combating extremism in the Middle East, the current European security system appears to conform to the predictions of the late 1990s. Threats appear in various shapes and sizes ­– state and non-state actors, violent and non-violent situations, regular and irregular warfare. At the same time, a wide range of entities are attempting to solve both symptoms and causes of the challenges to stability and security in Europe. What can NATO contribute to all of this? While NATO member countries have forces to respond to crises, they are not independently sufficient to deal in an integrated way with complicated situations that may arise. In the end, there must be an overarching element to provide direction and guidance to military units and synchronize military activities with those of other actors working toward the same end. From 1 July 2017 till 30 June 2018 1 (German/Netherlands) Corps (1 (GE/NL) Corps) will be on standby to be that element, ready to serve as land-centric Joint Task Force Headquarters (JTF HQ (L)) as part of the NATO Force Structure (NFS). It is not the first time that 1 (GE/NL) Corps is a forerunner and it is definitely not the only role 1 (GE/NL) Corps can fulfil within the NFS. This article describes the path 1 (GE/NL) Corps followed to successfully pass the certification exercise Trident Jaguar 2017 at the Joint Warfare Center (JWC) in Stavanger, Norway, and to be fully prepared to lead operations as a JTF HQ (L) in case called upon by NATO or Germany and the Netherlands as framework nations or other organizations like the United Nations or EU, together with non-military partners to bring a crisis to a sustainable resolution. This journey must be connected to the strategic context in which it took place. Therefore, first a description will be given of the strategic security context and the requirements which are needed to be effective in the current and anticipated operational environment. The following parts describe the roles 1 (GE/NL) Corps can fulfil within the whole spectrum of operations, from peacetime military engagement to war fighting operations and how 1 (GE/NL) Corps fits into the NFS. This generic description sets the scene to understand the value of deepened integration and the comprehensive approach as two distinctive characteristics of 1 (GE/NL) Corps. The final part focuses on 1 (GE/NL) Corps role as JTF HQ (L) and describes the efforts that were made to become one of NATO’s most effective command and control elements which is rapid, comprehensive and decisive. The conclusion contains a summary of the most important observations. The security situation in and around Europe is under pressure. In the Wales Summit Declaration of Sep 2014, the Heads of State and Government of the NATO member states agreed that the current security situation can have long-term consequences for peace and security in the Euro-Atlantic region and stability across the globe. In Europe, multiple threats are emerging. Russia is more assertive than ever creating uncertainty in eastern Europe and reinforcing its influence by using all instruments of national power to achieve its political objectives. In addition, in 2016 the existing number and increased influx of refugees into southern Europe created a crisis while terrorists carried out attacks in unexpected places. Simultaneously, Western pre-eminence is in decline in other parts of the world, which has decreased its global influence. Besides the changes in the European security context, the characteristics of crises and conflicts changed as well. The character of conflict is constantly in flux; concepts like war, peace and stability have become relative and blurred. As a consequence, the complexity of operations has further increased. Therefore, a military organisation has to meet a multitude of different and parallel challenges, ranging from conventional to hybrid crises to civilian dominated crises and conflicts. These complex crises and conflicts require the military to contribute to a comprehensive approach. This implies working with partners to develop solutions that employ all instruments of national and international power by integrating for example the political, security, development, rule of law, human rights and humanitarian dimensions during a mission. The comprehensive approach for conflict resolution requires effective coordination and cooperation among all participants prior to and during an operation. These participants can be national governments and agencies, international organisations (IOs), non-governmental organisations (NGOs) as well as other civilian organisations or actors. However, it is not enough just to coordinate and cooperate. All participants should develop a shared understanding of the crisis and its dynamics and, furthermore, support an agreed intent and mutually supported objectives. As described above, international and inter-agency cooperation is paramount for conflict resolution. The comprehensive approach can only succeed when supported by non-military cooperation, through which military organisations will be better equipped to achieve shared objectives when they continuously conduct operations together with others. For their part, military organisations need a long-term investment in personal relations, in knowledge and in institutions to continuously build trust, without ignoring the ability to fight. In 2010, NATO decreased the number of headquarters in the NATO Command Structure (NCS), while maintaining the same level of ambition, i.e., two major joint operations (MJO) and six small joint operations (SJO), which consist of up to corps or divisional level operations, respectively. The nine deployable High Readiness Forces (Land) Headquarters of the NFS, therefore, assumed responsibility for meeting a variety of needs derived from anticipated requirements. Within this structure 1 (GE/NL) Corps fulfilled three different roles at the tactical as well as the operational level. Firstly, a Corps headquarters at the tactical level, secondly, a Land Component Command (LCC) as part of the NFS at the tactical level and, finally, as of 1 July 2017, Joint Task Force Headquarters (Land) at the operational level. In addition, in all three roles 1 (GE/NL) Corps is also capable of acting as a professional training platform for brigades and divisions of the framework nations within 1 (GE/NL) Corps. For example, in exercise Vital Sword, which will take place in October and November 2017 in Wildflecken, Germany, 1 (GE/NL) Corps provides oversight and higher headquarters support. The Corps develops a scenario and directs the exercise to enable Headquarter 1. (DEU) Panzer Division to become initial operational capable and for Headquarter German Division Schnelle Kräfte to become final operational capable. As a Corps headquarters 1 (GE/NL) Corps must be able to plan, organize command and control combined offensive, defensive and stability operations and enable land tactical activities across the entire mission spectrum to fulfil the full range of NATO missions. This means from peacetime military engagement to major combat operations. As a LCC 1 (GE/NL) Corps acts at the highest tactical level, is part of a multinational joint force and is capable of providing command and control to land forces, including theatre combat support and combat service support forces. Although a Corps headquarters can also be subordinate to an LCC, both act at the tactical level. A Corps headquarters conducts command and control over a task-organized force which executes military operations. 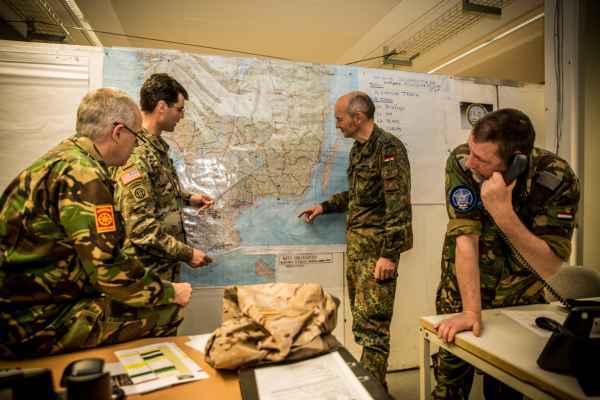 A LCC coordinates tactical activities with other components of the multinational joint task force at the operational level. The subordinate land forces of the LCC are task organized and execute the operations. A JTF HQ (L) is a deployable joint command and control capability at the operational level to conduct a land heavy small joint operation (SJO (L)) and is responsible for integrating the effects of multiple components and agencies. As such, 1 (GE/NL) Corps, as JTF HQ (L), is responsible for coordinating and synchronizing the contributions of Maritime, Air, and Special Forces components as well as that of the ground component. Next to the typical war fighting functions, a JTF HQ (L) must also be able to conduct tasks, such as key leader engagement, strategic communications, coordinating joint fires, targeting and with its own Joint Logistic Support Group Headquarters (JLSG HQ) to receive the incoming force and to sustain it. This JTF HQ (L) role is significantly different in that the commander and staff are responsible for integrating capabilities with which they were not familiar at the tactical level. Not to be overlooked is the differing perspective required for each of these formations and the requirements for interoperability. The latter is one of the important reasons why 1 (GE/NL) Corps established, as one of the first headquarters, a strategic partnership with NATO’s Communications and Information Agency to improve interoperability. It was also the reason 1 (GE/NL) Corps embraced NATO 1st Solution, which promotes interoperability through seamless integration with existing NATO capabilities, providing a cost-effective solution with reduced complexity. Differences exist beyond the hierarchy of formations but also in the nature of the operations that the headquarters will carry out. In both the traditional Corps and LCC roles, the headquarters focuses on the tactical level, albeit at the highest echelon, where it is concerned with the execution of battles and engagements to achieve military objectives. As the JTF HQ (L), a headquarters is elevated to planning and executing at the operational level where it is concerned with the arrangement of military operations in pursuit of strategic objectives. Although a JTF HQ (L) operates at the operational level, NATO has maximized the efficiency of these headquarters by developing an ‘integrated model’ in accordance with which a JTF HQ (L) serves as both the joint force headquarters as well as the LCC. Being familiar with its tactical, land-centric responsibilities, 1 (GE/NL) Corps preparing to assume the role of JTF HQ (L) faces two primary challenges: integrating joint capabilities and raising its focus to the operational level. These overarching requirements include a number of component issues that 1 (GE/NL) Corps had to address as it looked forward to having to assume JTF HQ (L) standby status in July 2017. The headquarters of 1 (GE/NL) Corps is part of the NFS and is one out of nine NATO’s High Readiness Force (Land) Headquarters. 1 (GE/NL) Corps was established on 30 August 1995 in Münster, Germany, when 1 German Corps and 1 Netherlands Corps merged. In 1997 Germany and the Netherlands signed the Corps Convention and the Corps Agreement. The two nations were now officially committed to share the responsibilities for the bi-national Corps framework on an equal basis. Although the headquarters was a bi-national Corps, it acted according to its motto: Communitate Valemus – ‘Together we are strong’. Participation was open for other NATO members. The Corps transformed into a multinational Corps in 2002. As a result of the NATO decision to establish a new NFS, 1 (GE/NL) Corps certified in 2002 as one of the first High Readiness Forces (Land) Headquarters of the NFS. It was now fully operational capable. On 10 February 2003, 1 (GE/NL) Corps deployed to Kabul, Afghanistan, where it took over command of the International Security Assistance Force (ISAF), which was then not a NATO mission yet. In addition, 1 (GE/NL) Corps provided the core of the composite HQ ISAF in 2009 and 2013. In 2004 the Corps certified as part of the NFS as a LCC for the new NATO Response Force (NRF). As a result, the Corps was on standby for the NRF during the first half of 2005, and also during the first half of 2008, and in 2015 for the duration of the entire year. In addition, 1 (GE/NL) Corps provided a test bed for the interim Very High Readiness Joint Task Force (VJTF) in the first half of 2015 and conducted the exercise Strong Sword in Zagan, Poland. The next step in the Corps’ development, as a result of the decision taken at the Lisbon Summit in November 2010, was to certify as JTF HQ (L) and to be on standby from 1 July 2017 until 30 June 2018. However, this is not the end of the development of 1 (GE/NL) Corps. Although 1 (GE/NL) Corps is currently standby as JTF HQ (L), it is already preparing for its next role as LCC of the NRF. 1 (GE/NL) Corps will be standby as of 1 January 2019 till 31 December 2019. Over a period of 21 years 1 (GE/NL) Corps developed from a bi-national corps in 1995 into a multinational High Readiness Forces (Land) Headquarters which deployed three times, was three times on standby as part of the NRF and also conducted the test bed for the interim VJTF. The Corps grew from two to currently twelve nations: Belgium, Czech Republic, France, Germany, Greece, Italy, Netherlands, Norway, Spain, Turkey, United Kingdom and United States. Most of its members have been deployed at least ones. Although it can be a challenge to fulfil three different roles at the tactical as well as the operational level with twelve different nations, the main advantage of 1 (GE/NL) Corps is that multinationality enriched 1 (GE/NL) Corps in all its roles. The ability to conduct multiple roles with a diversity of nations and personnel provides Germany and the Netherlands, as the two framework nations, a flexible, adaptive and highly deployable 1 (GE/NL) Corps. This is especially important at times when our security situation is in decline and the future impossible to predict. Although 1 (GE/NL) Corps fulfils the same tasks as the other HRF (L) HQ’s and although there is close cooperation with these headquarters, especially with Rapid Reaction Corps France (RRC FRA), there are two characteristics that make 1 (GE/NL) Corps a uniquely capable command and control platform. The first characteristic is deepened integration, which means that 1 (GE/NL) Corps is built on the firm basis of international military cooperation between the two strong framework nations. Germany and the Netherlands have taken international military cooperation a step further by integrating military capabilities. Personnel from one or more framework nations compose two-thirds of 1 (GE/NL) Corps staff. In addition, both supporting battalions, the Staff Support Battalion as well as the Communications and Information Systems Battalion are fully integrated bi-national units. 1 (GE/NL) Corps serves as an exemplar and transformation platform for other forms of international cooperation like training, defence material procurement and cyber. Based on mutual trust and positive experiences of either framework nation, Germany and the Netherlands have over time deepened their integration. For this purpose, the respective Defence Secretaries signed a Declaration of Intent on 28 May 2013, which was the basis for the full integration of 11 (NLD) Air Manoeuvre Brigade into the German Division Schnelle Kräfte. Subsequently, on 17 March 2016 43 (NLD) Mechanized Brigade was integrated in 1. (DEU) Panzer Division and 414 (DEU) Tank Battalion became part of 43 (NLD) Mechanized Brigade. Germany and the Netherlands were only able to take this step because of the experiences within 1 (GE/NL) Corps since 1995 and the investment of the two nations in professional and personal relationships at all levels. The second element that makes 1 (GE/NL) Corps distinct is the way 1 (GE/NL) Corps has operationalized the comprehensive approach which is the centrepiece of our planning and execution during exercises and operations. Whether 1 (GE/NL) Corps plans or conducts crisis response or war fighting operations, it always emphasizes a comprehensive approach. 1 (GE/NL) Corps deliberately and constantly invests in this comprehensive, whole-of-society network as shown during the Common Effort exercises. This led in 2015 to an event during which 24 international, governmental and non-governmental organisations of the Common Effort Community signed a cooperation statement and where Mrs. Ursula von der Leyen, German Defence Secretary, addressed the international audience. The Common Effort Community is a perfect example of the comprehensive approach and a long-term investment in professional and personal relations, in knowledge and in institutions. By interacting effectively with other actors, while respecting each other’s mandate, 1 (GE/NL) Corps is able to facilitate holistic solutions for complex problems. Acknowledging the need for a variety of headquarters, NATO has drawn up a rotation plan for its headquarters, to develop a deliberate plan to enhance the capabilities and capacities it would need to serve as a joint headquarters. Therefore, starting in 2014, 1 (GE/NL) Corps began the ‘Road to JTF’ based on guidance from SHAPE and lessons learned from other headquarters which had already travelled this challenging road. The Corps’ plan included a number of lines of operation across the headquarters designed to comprehensively transform the headquarters from its focus as an LCC as part of the NATO Response Force to a Joint Force Headquarters. While this transformation impacted the entire headquarters in a variety of ways, some areas of special emphasis will be highlighted, primarily because they particularly relate to the challenges of transforming into a JTF HQ (L). Above all, the headquarters had to shift to a joint mindset, a change in perspective so that the commander and staff no longer focused exclusively on land force tactical operations but expanded their considerations to include the missions and capabilities of joint forces as well. 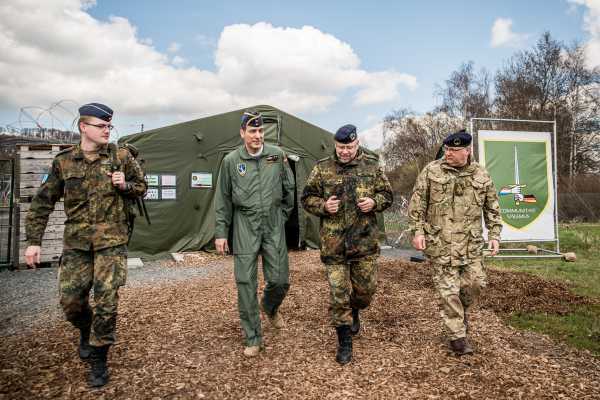 After the activation order of NATO, the first elements must be deployable within days and the HQ must be fully operational capable within weeks. In short, 1 (GE/NL) Corps faced significant changes in the areas of education, training, procedures and structure (to include personnel). One of the initial ways to reorient the thinking of the staff was through education. To facilitate the shift from land to joint command and control the staff of 1 (GE/NL) Corps first needed to know what they did not know and then they needed to fill the gaps through instruction both on joint capabilities and on operational planning. The process started with a JTF seminar in November 2015, during which the fundamentals of JTF operations were explained. Later, 1 (GE/NL) Corps conducted a key leader seminar in June 2016 to familiarize senior members of the staff with the requirements of a joint headquarters. 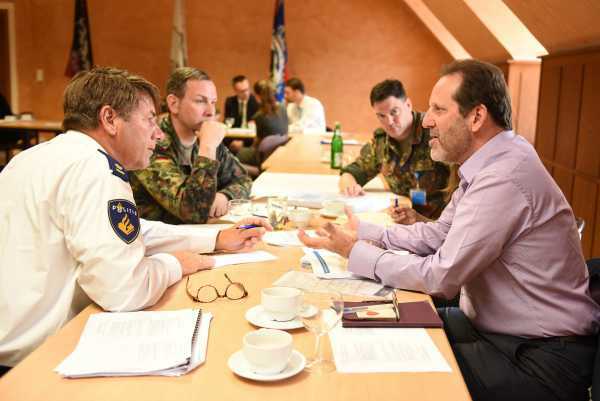 Coupled with this individual education, 1 (GE/NL) Corps participated in a Comprehensive Operations Planning Course, hosted by RRC FRA and facilitated by the NATO School Oberammergau. This course significantly contributed to the cooperation between 1 (GE/NL) Corps and RRC FRA and closed gaps both with respect to a joint mindset and to elevating planning to the operational level. The transition of 1 (GE/NL) Corps also required some concrete measures to ensure that it would be able to accomplish its assigned tasks. Again, working with SHAPE, NATO’s Joint Warfare Center (JWC) and consulting lessons identified by its predecessors, 1 (GE/NL) Corps developed a detailed set of Corps Standard Operating Instructions (SOIs). For its part, SHAPE provided a series of generic Standard Operating Procedures for Joint Force Headquarters to contribute to interoperability and to serve as the basis of Corps SOIs. Because all corps headquarters are structured slightly differently they develop a set of unique SOIs that modify existing SOPs to fit the structure and preferences of that particular headquarters. 1 (GE/NL) Corps SOIs served as the basis for the Corps battle rhythm and staff process during preparation for the JTF standby period in order to implant terms and procedures in the normal staff routine and provided the foundation for the conduct of exercises to refine these documents. At the same time, these efforts could not entirely close the gap. Because of the increased range of responsibilities required of an operational-level headquarters and the need for expertise in joint capabilities, the headquarters also needed additional personnel. 1 (GE/NL) Corps resolved this issue through the (relatively) permanent assignment of staff officers to the headquarters and the incorporation of augmentees at critical junctures. The 1 (GE/NL) Corps framework nations (Germany and the Netherlands) supplied maritime planners to both J5 and J3 and the NATO JFAC likewise provided air planners. In addition, a variety of organizations, such as the NLD Maritime Force, the NLD Cyber Command and the Italian and British JFAC, all supported the headquarters during exercises as would be expected in the event of an actual deployment. As a result, 1 (GE/NL) Corps has had both a regular joint presence and a robust, augmented staff for its exercise to refine and develop processes and procedures it would need in its new role. The Corps exercise plan came on top of these adjustments which provided a progressive structure designed to transform 1 (GE/NL) Corps in a measured, manageable fashion from a land-centric, tactical headquarters into a joint, operational-level C2 platform. Although SHAPE certified 1 (GE/NL) Corps, JWC supported 1 (GE/NL) Corps exercises on the ‘Road to JTF’. The exercises followed a typical ‘crawl-walk-run’ framework to provide opportunities to learn lessons and subsequently to implement them. The Corps took its first step toward joint command and control capability in April 2016, with the conduct of exercise Truthful Sword, which focused on providing command and control of a land-centric JTF conducting stability operations. Following this event, 1 (GE/NL) Corps demonstrated initial operating capability as a JTF HQ (L). The next step consisted of an externally evaluated Crisis Response Planning (CRP) event in September/October 2016, during which the headquarters’ planners implemented NATO’s Comprehensive Operations Planning Directive (COPD) to develop a joint, operational-level Operations Plan (OPLAN). Building on the success of the event, 1 (GE/NL) Corps used that OPLAN to conduct exercise Ultimate Sword in December 2016 to evaluate the ability of the Corps’ JLSG HQ to support deployment and reception, staging, onward movement and Integration (RSOMI) of the joint force as well as to provide an initial evaluation of the Corps’ ability to command and control joint forces in a high-intensity non-article 5 crisis response SJO(L). This is not only kinetic, but certainly comprehensive, as explained earlier. The final exercise event in 1 (GE/NL) Corps’ Road to JTF was the exercise Trident Jaguar 2017, which was the headquarters-wide deployment to the JWC in Stavanger, Norway for its final external evaluation and certification as JTF-capable by SHAPE. The evaluators noted three topics that needed attention. Firstly, 1 (GE/NL) Corps should establish fixed relationships with the required augmentees in order to properly train them before deployment. Secondly, some of the Standard Operating Instructions of the HQ have to be improved. Thirdly, 1 (GE/NL) Corps should develop a Maritime Operations Coordination Center (MOCC) in line with the Air Operations Coordination Center (AOCC) which is already in place for 1 (GE/NL) Corps. 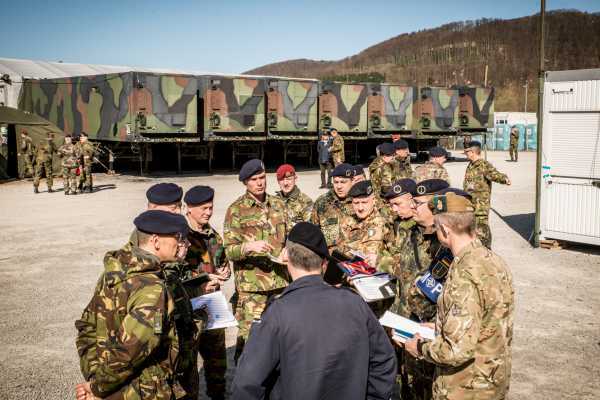 This series of exercises brought together all the efforts of the headquarters and facilitated the creation of a highly capably, joint and operationally minded staff, ready to deploy in support of NATO requirements. While the headquarters experienced fundamental changes in orientation, it retained its determined focus on developing comprehensive solutions. Throughout its history, regardless of the level of war on which it focused, 1 (GE/NL) Corps has appreciated the absolute necessity of integrating military activities with those of other actors with whom they would interact in a crisis situation. Leaders have understood that the Corps’ contributions alone are insufficient to achieve an enduring end state. When serving as a tactical headquarters, 1 (GE/NL) Corps’ planners focused their efforts on cooperation with IOs and NGOs to ensure that they could simultaneously support each other. At the operational level, as a JTF headquarters, 1 (GE/NL) Corps had to do more, given its responsibility for developing and executing a campaign plan. The JTF HQ is not only the highest military HQ in theatre, but also needs to engage at the highest level and work together with government officials. Working at a higher level required planners to identify objectives and effects that the military would not be able to accomplish itself, but would require assistance from the IOs/NGOs and other instruments of national power. Instead of mere cooperation on the ground, joint plans required synchronizing objectives and identifying effects that non-military partners could create as part of a broader plan. With this in mind, 1 (GE/NL) Corps embarked on specific annual exercises, dubbed Common Effort, to improve awareness, create familiarity, and develop tools for working together. Over time, these interactions have greatly enhanced the Corps’ and civilian counterparts’ ability to think, plan and act in a comprehensive manner, contributing to integrated solutions that produce lasting results. In the disarrayed current strategic security context, 1 (GE/NL) Corps has to meet a multitude of different and parallel challenges, ranging from conventional to hybrid or civilian dominated crises and conflicts. It is also clear that a sustainable solution requires a comprehensive approach. Therefore, the Corps constantly explores new and better ways to cooperate with others. A good example is the standing Common Effort Community in which it invests in long-term personal relations, in knowledge and in institutions. By doing this, the Corps fulfils a requirement of NATO to have effective command and control elements available to achieve the political objectives. Over the past 21 years 1 (GE/NL) Corps has fulfilled three different roles at two different levels; Corps headquarters, LCC as part of the NRF at the tactical level and, as of 1 July 2017 Joint Task Force Headquarters (Land) (JTF HQ (L)) at the operational, as well as the operational level because of NATO’s integrated model. The Corps deployed three times and was also three times on standby as part of the NRF. By not specializing in one role the Corps remains flexible, adaptive and highly deployable especially in times when our security situation is under pressure and the future impossible to predict. In addition, the Corps is a catalyst and a transformation platform for other forms of international cooperation such as training, defence material procurement and cyber. Everything in line with 1 (GE/NL) Corps’s motto: Communitate Valemus – ‘Together we are strong’! 1 (GE/NL) Corps has a notable record of performance in actual operations. While the Corps can be proud of those operational deployments, it has increased its capabilities in significant aspects than at any point in its past. Rather than exclusive land-focused expertise, 1 (GE/NL) Corps now appreciates a broader range of military capabilities. Similarly, it has focused from battles and engagements at military objectives to the development and implementation of campaign plans to achieve higher level outcomes. Finally, the Corps is more than ever comfortable with and committed to developing integrated solutions in conjunction with partners from the civilian sector. 1 (GE/NL) Corps characterizes itself as ‘rapid-comprehensive-decisive’, but those words no longer adequately summarize the Corps. While retaining this trio, it could add ‘joint-minded’ and ‘operationally-focused’. This combination makes this headquarters singularly ready, should it be called upon by NATO or its framework nations, to prevent a crisis or bring it to a sustainable resolution. 1 (GE/NL) Corps, ready for operations! * Colonel Jan-Willem Maas works as an artillery officer in the Royal Netherlands Army. His current appointment is that of Assistant Chief of Staff J5 (ACOS J5) in 1 (German/Netherlands) Corps in Münster, Germany. ACOS J5 provides policy recommendations and assists the commander in planning and preparation of joint plans, orders and associated situation estimates across the full spectrum of operations. Lieutenant Colonel Matthias Greune works as a mechanized infantry officer in the German Army currently appointed Deputy Assistant Chief of Staff J5 (DACOS J5) in 1 (German/Netherlands) Corps in Münster, Germany. One of the main tasks of DACOS J5 is to lead the Joint Operational Planning Group of the Joint Task Force Headquarters. He is currently deployed as Strategic Advisor to NATO’s Resolute Support Mission in Afghanistan. Stephen J. Gerras, ed., Strategic Leadership Primer, 3rd ed., (Carlisle Barracks, PA: U.S. Army War College, 2004) 1, accessed on 10 Feb 2017 at https://www.carlisle.army.mil/ orgs/SSL/dclm /pubs/slp3.pdf. NATO, Wales Summit Declaration, 5 September 2014. See: http://www.nato.int/cps/en/natohq/official_texts_112964.htm. F. van der Putten, J. Rood and M. Meijnders, Clingendael Monitor 2016, May 2016. See: http://www.clingendael.nl/sites/default/files/ clingendael_monitor2016-great_powers_and_global_stability-eng_0.pdf, 8. K. Rintakoski, M. Autti, ed., Comprehensive Approach, 17 June 2017. See: http://www.defmin.fi/files/1316/Comprehensive_Approach_-_ Trends _ Challenges_and_Possibilities_for_Cooperation_in_Crisis_Prevention_and_Management.pdf, 9. NATO Standardization Office, Allied Joint Doctrine for Land Operations 3.2 (Brussels, NSO, March 2016) 1-5 – 1-6. NATO Standardization Office, Allied Joint Doctrine for the Conduct of Operations 3(B) (Brussels, NSO, March 2011) 1-2. LTC (GS) (DEU A) Michael Reinkunz and MAJ (ITA A) Dario Paduano, ‘Joint is Coming Soon’, in: Everywhere Rapidly of NATO Rapid Deployable Corps Italy (2014) (20) 6. Supreme Headquarters Allied Powers Europe, High Readiness Forces and Headquarters in the NATO force structure. See: https://www.shape.nato.int/page 134134653. NATO Communications and Information Agency, NATO 1st Solution for NATO Force Structure. See: https://www.ncia.nato.int/Documents/Agency%20 publications/Brochure%20NATO%201st%20Solution%20for%20NATO%20Force%20structure_WEB.pdf, 2. 1 (GE/NL) Corps, Introduction. See: http://1gnc.org/introduction/. Ministry of Defence of the Kingdom of the Netherlands, Airmobile Brigade incorporated into Division Schnelle Kräfte. See: https://www.defensie.nl/english /latest/news/2014/06/18/airmobile-brigade-incorporated-into-division-schnelle-krafte. Civil-Military Cooperation Centre of Excellence, 22 May 2017. Lieutenant Colonel Matthias Greune works as a mechanized infantry officer in the German Army currently appointed Deputy Assistant Chief of Staff J5 (DACOS J5) in 1 (German/Netherlands) Corps in Münster, Germany. Lieutenant Colonel John Livingstone works as a strategist in the United States Army. He is lead planner in 1 (German/Netherlands) Corps in Münster, Germany, and acting DACOS J5. Colonel Jan-Willem Maas works as an artillery officer in the Royal Netherlands Army. His current appointment is that of Assistant Chief of Staff J5 (ACOS J5) in 1 (German/Netherlands) Corps in Münster, Germany.